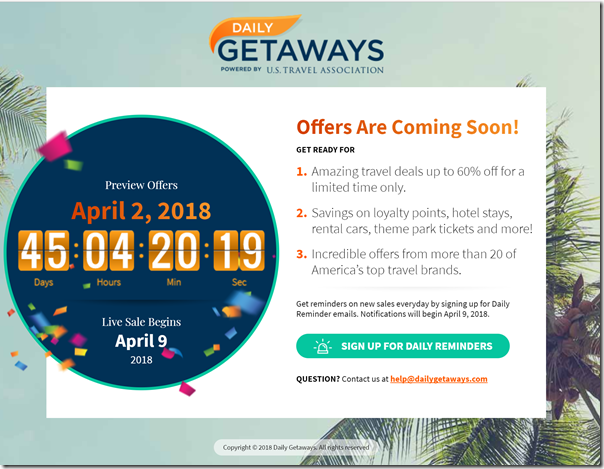 Steve's Deals : Sign Up For Daily Getaways News! Sign Up For Daily Getaways News! Daily Getaways is a website run by the US Travel Organization. They run their website for a few weeks a year that offers superb deals for hotels, car rentals, amusement parks and other things. The specials will begin this year on April 9th, but you can sign up to get a preview a week early, on April 2nd. Deals in the past include $50 Alamo gift cards for $25 (maximum 3 per rental), Marriott gift cards in different denominations, including $250 gift cards for $200, Universal Studios passes, and MUCH more. Careful with the Alamo gift cards--to not use them with the promo code that comes with them, rather use the code that you'll get if you come to the Steve's Deals seminar. Click here to read the post and register for the new date, March 3rd! The deals start at 1pm ET and some go within SECONDS so you have to be ready to click at 1pm to make the purchase. Purchases are open to residents of the US and Canada and all transactions are in USD. AMEX Biz Plat Going Up $100 On March 23rd! Beware of Air BNB Gift Card "Deals"
BUF to LA DIRECT for $249.96USD Return!